There is little more devastating for a therapist than failing a licensing exam. The only way to be taking a licensing exam is if you have spent years being successful taking exam. SATs, GREs, Mid-terms, finals, exam papers... you have to get past all of those to even come close to sitting for a licensing exam. If you have failed a licensing exam, you are not alone! Nobody will be harder on you than you will be. 99% of your colleagues will not think of you any differently, and will have compassion for your experience. Your colleagues know you are a good therapist from working with you- a silly exam isn't going to change that. The preparations you made up to the day of your exam were probably exhausting. Your body and mind truly need rest before you will be able to make sense of all of this and make a game plan to pass on your next attempt. Now is NOT the time to make any long term decisions. You took the exam. You made the attempt. The are therapists out there avoiding this exam like the plague- afraid of failing- you did it- and guess what- you are still standing! And you still get to do therapy. And you still get to be you! There is nothing people hate more than me letting them know that the biggest preparation they need to be successful on their next attempt is anxiety reduction. I talked to a wonderful woman who called me for exam coaching after she failed her exam by 1 or 2 points. We talked about what happened- turned out her child had to be rushed to the doctors at 2am... and she had gotten some pitiful amount of sleep. Guess what I told her? She is fine! She needs to do very little to prep- missing by 1 or 2 points on no sleep after your child's sick is fabulous! Now, she just needs to watch the anxiety the next time she takes the exam and realize that the first exam experience was not representative of her ability to pass the exam. Connect with great people. Be social. Have fun. Use this as opportunity to build some great connections and network with other people. You might just meet some of your favorite humans through this experience. 6. Take your power back. Tap into your strengths, take care of your body, your mind- and make a game plan to pass on attempt #2. You can and you will do this! Hope this helps inspire you today! We talk a lot about the free online study group for therapists on here. Why? Because it is awe-some. And, I'll be honest- it has very little to do with me! Therapists sharing their exam success and getting cheers. Therapists sharing failing their exam and getting support, empathy, and encouragement. Therapists sharing study tips and tricks. Therapists sharing job opportunities with one another. Therapists sharing important information and getting answers to specific questions that can really help them succeed! Ultimately, it is simple a place where we've somehow attracted thousands of awesome counselors, marriage and family therapists, social workers and more into one place. Everyone has the same basic goal: Help and be helpful- and it works! It sounds silly, but my favorite example today are people sharing that there is a heating and cooling issue in one of the California testing sites. To be honest, I wouldn't have ever considered calling a testing center to find out if they were having an issue, or been prepared for it being NINETY degrees in a professional testing center! I'd be prepared with warm clothes for the traditional ice box that is testing centers- wouldn't you? But, several people have shared that this has been an issue for several weeks, people have dressed in summer clothes (in the Fall) just in case- and some have been able to make the determination to drive a little farther to take their exam so they could be more comfortable. Those little gems make me SO happy! The study group that I started out of my own selfish needs back in 2005 is more than I ever imagined, and here it is 10 years later provided support and encouragement to people who are looking for study materials, therapists who have failed the written licensing exam and don't know what to do, and therapists who just need a community to keep them inspired! How are you creating community in your life? How are you being helpful? Where are you getting help? Sign up for the free online study group today if you need some awesome community! So let's talk about the 5 steps to building community as a pre-licensed therapist. Realize that the work you do NOW to build an awesome community- will also build up your professional reputation and help you when you start a counseling practice! Be on the lookout for a great community. Look, search, and be dogged about finding people you can trust to connect with. Start with clear boundaries as you watch and learn the culture of the group, and determine how safe it is to be "real" in the group (online or offline). As you find safe places, be bold, brave, and authentic! Be a safe person for other people- hold what people tell you in confidence, be helpful, empathetic, and model what you'd want from others. Don't be afraid to "keep looking" if your first attempts at community building lead to some disappointments. Let's create more community! That is how we are therapists grow, develop, and stay inspired (just like we did in grad school!). Share your ideas for creating great community below! p.s. I'll be in Seattle, LA, and San Diego in November, and have free trainings every month on all aspects of starting a counseling practice. Check out the upcoming events here. Five things every counselor should be outsourcing. One thing counselors should never outsource. How to grow a private practice today. One thing that every counselor in America must know. Comment below and tell me what you learned, or even what you didn't like! I highly recommend you check out a few of the other podcasts as well. They are all fantastic! The California MFT Licensing exam, and several other state licensing exams for LCSW, LPC, Psychologist make a clear distinction between our legal requirements, and our ethical requirements. For many pre-licensed, and licensed individuals the two can easily get jumbled together in the carrying out of our daily duties. In addition, sometimes, cultural norms within our professions can be perceived as ethical duties or legal requirements- when there is no such requirement. Not only can this hinder us when attempting to pass the licensing exams- it can be confusing in our future independent clinical practice. And that is what licensing exams are about- it is the licensing boards best effort to ensure we are ready to practice on our own without forced oversight. I wrote an article for ZynnyMe about Is it Ethical for me to ________ in private practice? While the questions I answered might not be on your mind for a bit if you aren't in private practice yet- definitely check out the recommendations for developing a clear understanding of your ethical obligations, and developing your own personal code of ethics! It is unethical not to accept insurance. It is unethical not to offer sliding scale to everyone who calls you. It is unethical to charge a certain fee. It is unethical to hire contractors to work within your private practice- no matter the situation. It is unethical to refer a colleague to any other business if that business offers any sort of thank you, or perk, for that referral. It is unethical to offer coaching if you are a licensed or unlicensed therapist. It is unethical to start to market or brand yourself prior to licensure. Read the entire post about common ethical questions in private practice here. Did you know that one of the things people search this site for is free study materials? The ethical code of your professional organization is one of those free study guides! Go and read it, soak it in, understand it- it will help you prepare for your exams and doesn't cost a dime! So excited to have the wonderful Maria Shufeldt submit an informative article outlining the process for applying for accommodations. 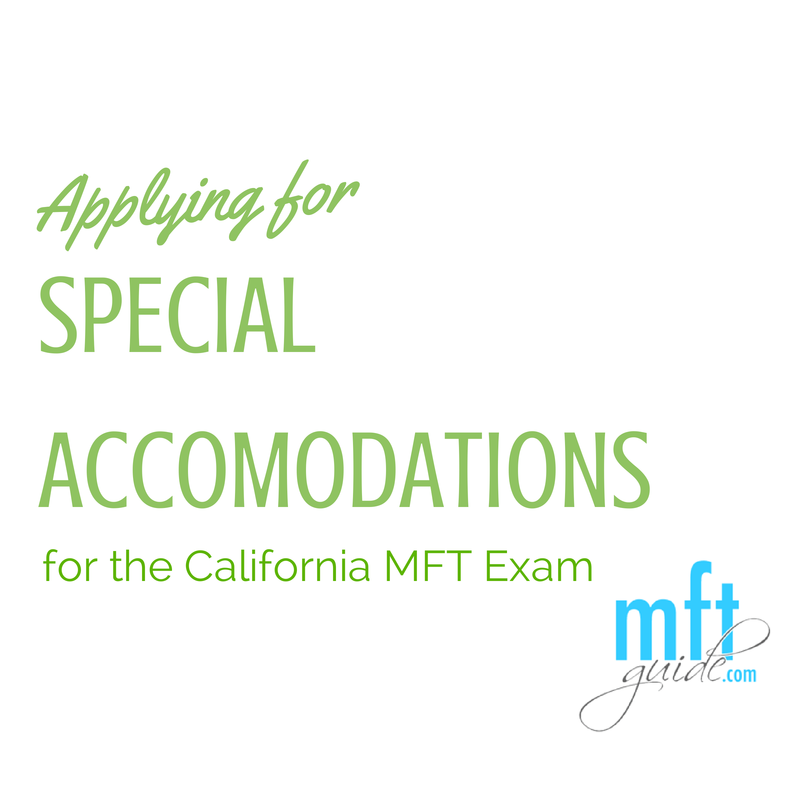 Give it a read, explore, and become informed about the options and process for asking for special accomodations when taking licensing exams in California. State and federal laws require the BBS to give exam applicants with documented disabilities an equal opportunity to perform on the licensing exams. Disabilities are generally defined as a condition or impairment that limit one or more major life activities. They may also include mental or psychological disorders, and specific learning disabilities. If you believe your test performance would be affected by such a condition, you may file a written request with the BBS at least 90 days before scheduling your exam. The BBS will evaluate your eligibility for “Special Accommodations” within the legal mandates. Accommodations must fall within certain limits, and may not alter the exam’s measurement of knowledge or skills. Specific accommodations approved will depend on BBS evaluation process, and may include: up to time and a half for exam completion, a private room, breaks to take care of special needs or use management strategies, or special equipment like seat cushions. You may also request to take the test by pen and pencil. A request is another form of application to the BBS, so make sure that you are timely, accurate, and thorough. Be patient: it’s the BBS, after all! Here are some steps that may help during the request process. I used clinical terms because it may help to remember this is a systemic process. Keep focus, not frustration in mind. 1. Assess yourself, the situation, and the presenting problem. Assess how all the bio/psycho/social factors of the testing process may affect you if you have a pre-existing condition. Try to visit the test site to assess the environment and ask questions of the facility staff. Think carefully about your daily functioning, and compare that with the exam conditions. Consult with a qualified medical or educational professional as soon as you determine you want to request accommodations. BBS requires testing and/or medical diagnosis, and will consider the length of time you have been in treatment, as well as requirements and recommendations for management during the exam. Some conditions may not qualify if corrected by aides or medication. (Examples: wearing eyeglasses, or taking ADHD meds). Finally, keep “test anxiety” out of your mind and vocabulary. It is not in the DSM. This is what we do ethically for our clients, but can be difficult for ourselves. Finally getting to exam stage requires many sacrifices and admirable qualities such as persistence and self-sufficiency. Yet the exam is not the time to “white knuckle” a known condition, hesitate to request assistance, or to ignore the possibility that a disability or non-diagnosed condition is affecting you. Remember (as if you didn’t know): it’s a 6 month wait to retake the exam. Submit your Request for Accommodations to the BBS Special Accommodations Specialist at least 90 days before scheduling your test date. The BBS will evaluate your request and mail you a letter of official approval with specific accommodations. You can check on status by phone or email to the BBS Specialist. If your request is approved, BBS will send you a letter that specifies your Special Accommodations. You will schedule your exam by phone only with PSI’s Accommodations Unit only. When you call, ask PSI if they have received an upload of your accommodations approval from BBS. You cannot schedule until this is in place. You can follow up with BBS and/or ask PSI to call you when it is received. Once you are scheduled and starting your study process, you may want to ask your test coach how to incorporate accommodations in your mock exams. On test day, be sure to bring everything you have been allowed for your accommodations, including the letter of accommodation from the BBS. Generally, BBS will apply approved accommodations for the 1st. You will receive another mailed letter for the second accommodations, and you should follow the same steps outlined above. BBS maintains confidentiality on your Special Accommodations status, but you will make the decision yourself about disclosing to colleagues and friends or family. This decision generally comes up when people ask you “how long did it take,” or other details about the testing conditions. You did this with special accommodations, not because of them. Yeah... I know.... the site is called MFTGuide... I get why you wouldn't think we have any connection to ACSW and LCSWs. To be honest, I let some really well meaning, awesome business advisors convince me to name my site mftguide... If I was to go back in time- I'd choose something else. Back to the point. While the process that prelicensed therapists go through to get licensed is quite similar, and exam formats may be similar, the material can be quite different. It is important to choose study materials that understand the material that will be on the exam for your particular license. While I empathically recommend picking up a paid study program before taking licensing exams- I also believe studying for licensing exams should start in graduate school. Ok... I'm not talking about stay up every night stressing and sweating for hours studying. I'm just talking about digesting material throughout your process of gathering hours that will make the process of preparing for licensing exams less stressful. It isn't uncommon for interns and associates to realize, during the studying process that they had been doing some things wrong, or been misinformed for YEARS! Many say- I wish I would've known this at the start of this process. One fun way (if you can let go of the text anxiety aspect) to start prepping is with free LCSW study materials online and LCSW study apps. I'm sharing these resources here as a fun way to bring material into supervision, consultation, or even into a monthly exploration of- wow I didn't know that! session. BTA Exams Lite is a free program developed by a LCSW and professor at UC Berkely in California. It has 25 free questions and is available on Android and Iphone. LCSW Quiz: California has a small bank of 15 questions developed by Gerry Grossman seminars. Are you a Pinterest lover? Check out this board and this board for some fun links to materials. People sharing flash cards they developed to study for exams here. Make sure to verify information is correct! Do you have materials that you've used to study for the LCSW or LMSW exam? Share them in the comments below! I started a free MFT study group back in July of 2005. I had failed a licensing exam, felt humiliated and wasn't sure what to do next. My clinical supervisor hadn't taken the written clinical vignette, and had failed the oral exams several times. She had no words of wisdom before, or after I took my licensing exams. I started the free study group for MFT Interns studying for the clinical vignette on a whim after failing my written clinical vignette exam by 1 point. Sometimes that is just how these things start, on a whim, selfishly. I am SO glad that I did, it was a major turning point in my professional career. The study group currently has pre-licensed MFT, LPC, LCSW, MHC studying for California Exams, National Exams, and other state specific exams. There are over 1040 members currently helping each other down the path to successful, licensed practice. While some professional organizations have clubs for pre-licensed individuals, many do not. Many pre-licensed therapists feel less than, left out, unseen. They are biding their time patiently to get licensed and "emerge." In a pre-licensed group the sense is that you are great right where you are. Everybody is there with you, and rooting for you as you go forward. Nobody feels less than, just excited for one another! I remember asking the 1 person I knew who had taken the written clinical vignette exam what study materials I should get, or what advice she had. She had none. She felt like it was a fluke she passed. She didn't know what to tell me. My supervisor recommended a program with a lady whose picture looked a bit crazy. That picture did NOT instill confidence. With over 1000 therapists in one place, ask and you shall receive. Is this study program worth it? You can get dozens of responses within a few hours usually. What should I do to prepare for my exam that is 3 days away? Dozens of responses with tried and true tips- and TONS of encouragement. It is easy to feel alone and powerless in the licensing exam process, and in the entire licensure process. Having hundreds of people who are in the process, finishing up the process, just starting the process. It is beautiful to see people stepping us as leaders, informing the next generation, who in turn step up as leaders, and inform the next people. I truly believe the online study group is going to train up an amazing group of future clinical supervisors. There is nothing like true, honest support while in the deep depths of a really bad day. Whether it is a letter from the BBS saying they didn't approve all your hours, frustration at a 10 month wait for exam approval, or failing your MFT exam by 1 point. Being able to post in a place where people really get you, or where others are experiencing the same thing is amazing. I've watched this process for almost a decade, and I might even say it is awe-inspiring. While asking a question like "What study materials should I buy for my MFT exams?" and getting dozens of responses is awesome. Sometimes, we don't need lots of opinions. Sometimes you just need someone who has the information. When you have questions like "How do I get someone at the BBS to pick up the phone?" Having someone who has a direct contact to share that meets your needs is the best feeling in the world. I wish I coudl see that I was that person with "all the answers." I'm not. I can't be. What is fantastic is that when you get hundreds and hundreds of passionate, determined therapists together someone has the answer. Or, someone is going to get the answer. These are the top 5 reasons why therapists need a free online study group. These are the reasons why even though I created the group selfishly, to meet my own needs, I've continued the group all these years. I always want pre-licensed therapists to know there is a place to go where they can get support! Would you like to join? We'd love to have you! Join the free online study group today. Are you already in the study group? Post below why YOU love the online study group. And give this article a share! Yesterday I posted that was I was full of gratitude for failing my clinical vignette exam back in 2005. It caused some major confusion for some people ;0) If you have failed your clinical vignette exam, written exam, or any licensing exam- you know it isn't something you feel grateful for in the moment. You don't feel grateful. You might feel angry, sad, numb, frustrated, confused, hurt, humiliated, humbled, panicked, fearful, overwhelmed, disappointed, embarrassed, and about a million other things. But, I've yet to meet someone that, in those first moments or hours feels grateful. No, I'm not one of those evolved humans who felt grateful for my failure in the moment. I still hate failing today, and I hated it then. That is probably one of my Top 10 worst days in my life... which considering my life story is actually pretty funny. Getting licensed. It often feels like the final "hoop" for people who have gotten a Master's degree in Psychology. Whether you are pursuing licensure in California, Washington, or across the United States, the process can be very anxiety provoking. Years ago, after failing my first exam by 1 point, and feeling completely alone, I started a free online study group to connect with other people going through the process. It was the most validating experience to realize that I wasn't alone, that my thoughts and feelings were normal, and to find support. Do you have support going through your exam study process? While the study group has morphed and changed since 2005 when I first started it, it remains active, and supportive. We are now located on Facebook. While the group started out for MFTs in California, the word has spread and has touched LCSWs, LPCs, MFCCs, MFTs, MHCs, and other designations from across the United States. A supportive environment to ask questions. No, people will not be sharing what is "on the exam" that would be illegal, but they will be helping one another prepare for the process, answering questions about study materials, and just providing emotional support. This is a place that is focused on moving forward, finding solutions, and being generally nice. So, if you are an awesome pre-licensed therapist who is nice, and wants support- come join us! Just click here and request to "Join" and we will get you set-up ASAP! How do I study for these #$@! exams? 8 Lessons we can learn about the anxiety associated with licensing exams.